Instead of Arcane Denial , Why not run A Censor ? It doesn't give your opponent two cards, on top of the fact it cycles. The way I understand it the counter remains uncounterable regardless of the "unless your oppononent pays 1." Instead of Arcane Denial , Why not run A Censor ? It is one mana cheaper and doesn't give your opponent two cards, on top of the fact it cycles. The way I understand it the counter remains uncounterable regardless of the "unless your oppononent pays 1." Mullac on UW Historic kinda..? 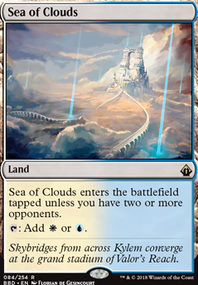 The thing is, if you are running 4 each of Cast Out, Censor, and Hieroglyphic Illumination, and running 22 lands(taking 2 out for 2 more Approach) you have an almost guaranteed chance to get the lands to get a t6 New Perspectives. 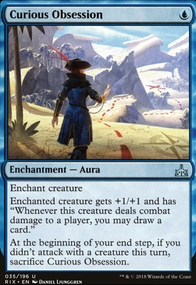 Running Curator of Mysteries and Compelling Argument also add more 1-mana Cycle effects, maybe using 1-2 Opt if you have space, Countervailing Winds because it's a decent counterspell, and depending on your colors using Archfiend of Ifnir, Shefet Monitor, and Haze of Pollen(as well as the Amonkhet Cycling duals) can give you an easier path to victory. On the side, Archfiend and Curator are alternate win cons as they are decent sized flyers for the mana. On the side, I'd run 1-2 copies of Abandoned Sarcophagus as it can let you utilize cards like Cast Out and Haze of Pollen that you cycled earlier in the game to get another handle on the game. 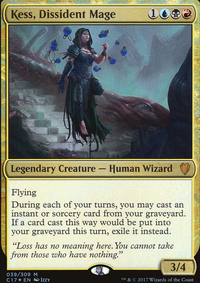 Also use that one card that cycles and gives you 2 life, that can help seal the deal against your opponent. I personally might consider using the M19(if you're playing Standard with this deck, which I assume you are) card that mimics Sphinx's Tutelage. 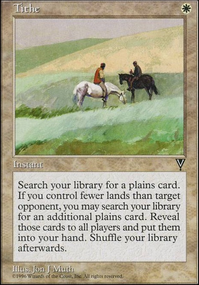 1, maybe 2 copies add yet another win con that can easily crush your opponent with a New Perspectives on the field. Wouldn't another interactive spell like Censor be better than Curious Obsession? Or is the damage and little extra card draw a little better? Arch of Orazca is kind of bad for this deck, you're right. However, I did play test this deck with some of the sideboard cards. I took out 2 Censors and put in 2 Mirror Images. I also had In Bolas's Clutches in and, while I did have it in my hand early on, I was able to draw the game out long enough to use it as well as Lay Claim. To make the deck faster, leaving out In Bolas's Clutches out is probably a better choice. toastySmorc, by all means, try out whatever variations you can imagine and let me know how it works out. It should go without saying that you want to wait till a creature is attacking before you bounce it, presumably opponents will do the same when trying to remove Tempest Djinn so Galestrike can save it. Censor is almost worth more in your graveyard then in your hand, opponents will practically give you a Time Walk over the course of a game playing around it by making less then ideal plays. This deck can’t hold off opponents indefinitely. There will always come a point where they can play more threats then you can deal with, so You need to find the right time to get a Tempest Djinn into play and attacking before that happens. Then it often becomes a race, but you expect to be able to remove their biggest threats every turn while swinging with your own. Did some playtesting andCensor's been mvp against threats like history, so I put some in the mainboard.